For the British judicial office whose holders are sometimes referred to as "Lady Justice", see Lord Justice of Appeal. "Justitia" redirects here. For other uses, see Justitia (disambiguation). Lady Justice (Latin: Iustitia) is an allegorical personification of the moral force in judicial systems. Her attributes are a blindfold, a balance, and a sword. She often appears as a pair with Prudentia, who holds a mirror and a snake. 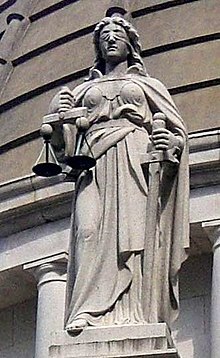 Lady Justice originates from the personification of Justice in Ancient Roman art known as Iustitia or Justitia after Latin: Iustitia, who is equivalent to the Greek goddesses Themis and Dike. The origin of Lady Justice was Iustitia, the goddess of Justice within Roman mythology. Iustitia was introduced by emperor Augustus, and was thus not a very old deity in the Roman pantheon. Iustice was one of the virtues celebrated by emperor Augustus in his clipeus virtutis, and a Temple of Iustitia was established in Rome 8 January 13 BC by emperor Tiberius. Iustitia became a symbol for the virtue of justice with which every emperor wished to associate his regime; emperor Vespasian minted coins with the image of the goddess seated on a throne called Iustitia Augusta, and many emperors after him used the image of the goddess to proclaim themselves protectors of justice. Though formally called a goddess with her own temple and cult shrine in Rome, it appears that she was from the onset viewed more as an artistic symbolic personification rather than as an actual deity with religious significance. The Ancient Egyptian Book of the Dead depicts a scene in which a deceased person's heart is weighed against the feather of truth. The personification of justice balancing the scales dates back to the goddess Maat, and later Isis, of ancient Egypt. The Hellenic deities Themis and Dike were later goddesses of justice. Themis was the embodiment of divine order, law, and custom, in her aspect as the personification of the divine rightness of law. 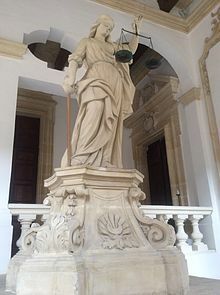 Lady Justice is most often depicted with a set of scales typically suspended from one hand, upon which she measures the strengths of a case's support and opposition. The Greek goddess Dike is depicted holding a set of scales. If some god had been holding level the balance of Dike (Justice). The scales represent the weighing of evidence, and the scales lack a foundation in order to signify that evidence should stand on its own. Since the 16th century, Lady Justice has often been depicted wearing a blindfold. The blindfold represents impartiality, the ideal that justice should be applied without regard to wealth, power, or other status. The earliest Roman coins depicted Justitia with the sword in one hand and the scale in the other, but with her eyes uncovered. Justitia was only commonly represented as "blind" since the middle of the 16th century. The first known representation of blind Justice is Hans Gieng's 1543 statue on the Gerechtigkeitsbrunnen (Fountain of Justice) in Berne. Instead of using the Janus approach, many sculptures simply leave out the blindfold altogether. 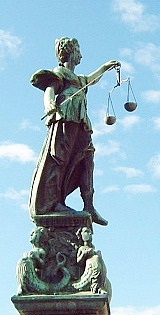 For example, atop the Old Bailey courthouse in London, a statue of Lady Justice stands without a blindfold; the courthouse brochures explain that this is because Lady Justice was originally not blindfolded, and because her "maidenly form" is supposed to guarantee her impartiality which renders the blindfold redundant. Another variation is to depict a blindfolded Lady Justice as a human scale, weighing competing claims in each hand. An example of this can be seen at the Shelby County Courthouse in Memphis, Tennessee. The sword represented authority in ancient times, and conveys the idea that justice can be swift and final. Lady Justice and her symbols are used in heraldry, especially in the arms of legal government agencies. Justice holding scales, $0.50 U.S. fractional currency. 5 Astraea, 24 Themis, 99 Dike and 269 Justitia, main belt asteroids all named for Astraea, Themis, Dike and Justitia, Classical goddesses of justice. ^ Hamilton, Marci. God vs. the Gavel, page 296 (Cambridge University Press 2005): "The symbol of the judicial system, seen in courtrooms throughout the United States, is blindfolded Lady Justice." ^ Fabri, The challenge of change for judicial systems, page 137 (IOS Press 2000): "the judicial system is intended to be apolitical, its symbol being that of a blindfolded Lady Justice holding balanced scales." ^ a b c "IUSTITIA". treccani.it. ^ See "The Scales of Justice as Represented in Engravings, Emblems, Reliefs and Sculptures of Early Modern Europe" in G. Lamoine, ed., Images et representations de la justice du XVie au XIXe siècle (Toulouse: University of Toulose-Le Mirail, 1983)" at page 8. ^ Image of Lady Justice in Berne. ^ Image of Lady Justice in London. ^ Colomb, Gregory. Designs on Truth, p. 50 (Penn State Press, 1992). ^ Image of Lady Justice in Memphis. ^ a b Brent T. Edwards. "Symbolism of Lady Justice". Retrieved 24 February 2017. Wikimedia Commons has media related to Iustitia.